I like 'open happiness' as an idea. Simple. Similar to their 'coke side of life' idea but I think I read somewhere they prefer this as it has a more obvious link to the product. This execution is a good example of a brand that uses the outdoor principles I wrote about earlier this week. Single image. Strong colour contrast between the image and background. Short headline. Better still, the headline is part of the creative. Strongly branded. Simple message. And lots of white space. 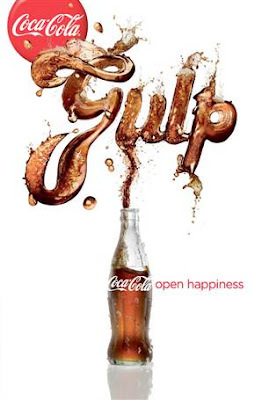 Personally I think this campaign makes the cola look like the immediate effects of a colonic irrigation. "open happiness", what a pile of poo. Everyone's done "happiness". Cadbury's did it years ago. As for your love of white space? You're beginning to sound like one of those marketing people who want to be in advertising. Leave the art direction to the art directors and stick to what you do best. Because you were doing it well. I do like white, but mean space in general, regardless of the colour. Every marketing grad and exec should know that 'space to breath' leads to better communication. If the marketing client doesn't understand the principles, the art director will have trouble getting her to buy his ad.